This is a sample entry from Tom Dosdall’s newsletter, Technical Ag Knowledge, published on Friday, December 30, 2016. Happy last day of trading, 2016! Here are some levels to watch as we turn the page and look ahead to the New Year. The last three months, this market has been a “buy” at the lower end of the range near 345’0 and a “sell” at the upper end of the range near 365’0. Large spec funds still hold a hefty net short position near 100K contracts so expect we could see some covering here on the last trading day of the year. Export #’s this morning came in within expectations at 958,600 MT. 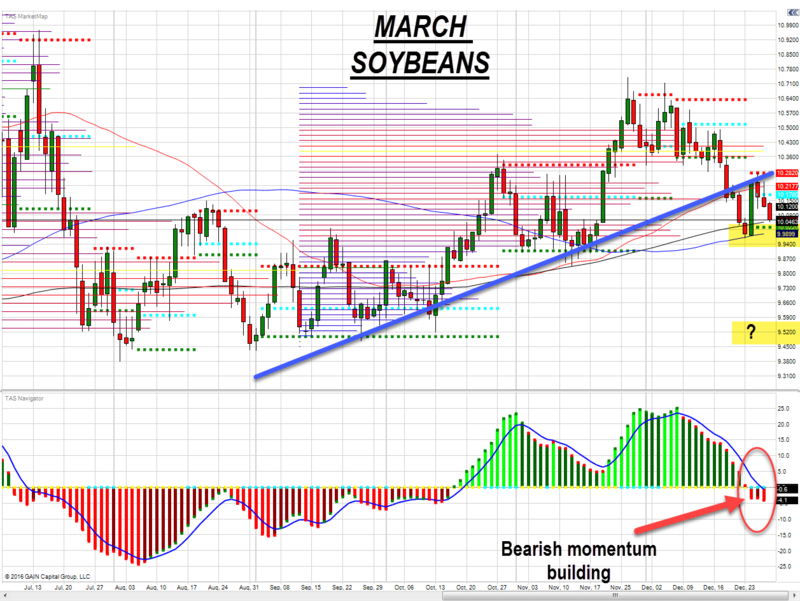 Watch Soybeans next week for as they go so too could go corn. Short term, I like being a buyer at around these levels. Longer term, for producers with un-priced bushels in their bins, I like strategies comprised of 1×2 call option spreads in the deferred months which can help to potentially squeeze additional juice out of a 20-30 cent rally, which may occur over the next 90-120 days. Unlike corn, funds are moderately long soybeans as we wrap up 2016. 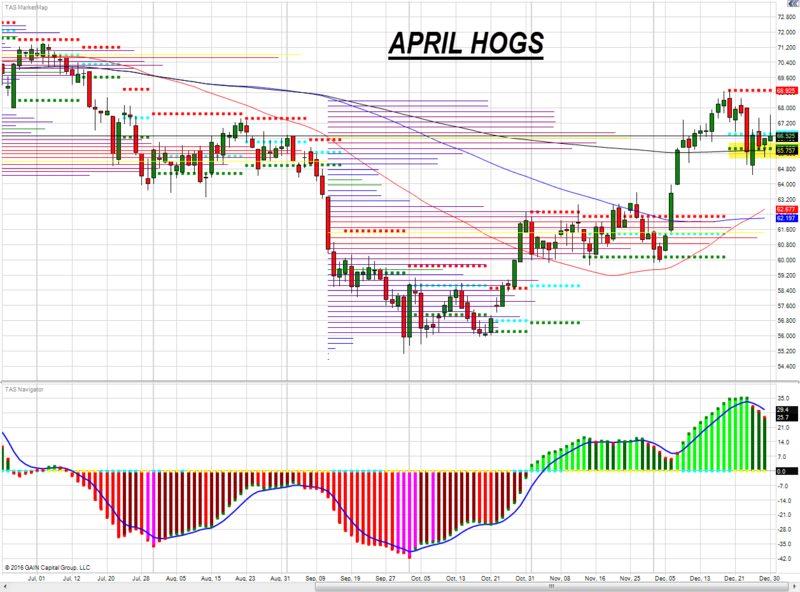 In my view, this market needs continued bullish fundamental news and/or technical developments to keep the bulls fed. Exports this morning disappointed the at only 974,100 MT. Key support near 1000’0 on the charts as the TAS demand level (green dots) intersects with the 100 and 200 day moving averages. 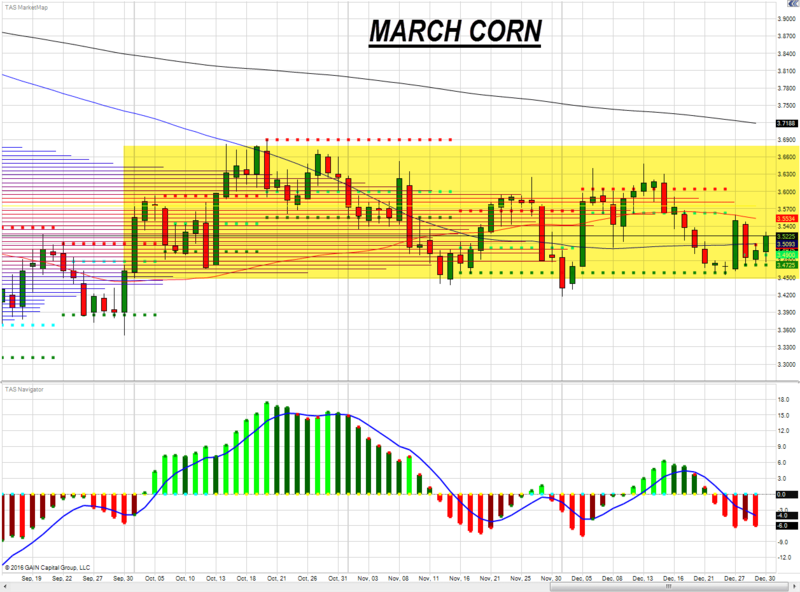 Could a close below these levels open the door for a potential run toward the previous demand base near 952’0? The technicals suggest this is possible. The old trend line support becomes new resistance at 1028’0. If you haven’t gotten an appropriate amount of 2017 soybean production protected yet, we strongly encourage reflection on your current margins and expectations on US planted acres this spring. Funds are still heavily short and exports beat expectations today at 568,100 MT. 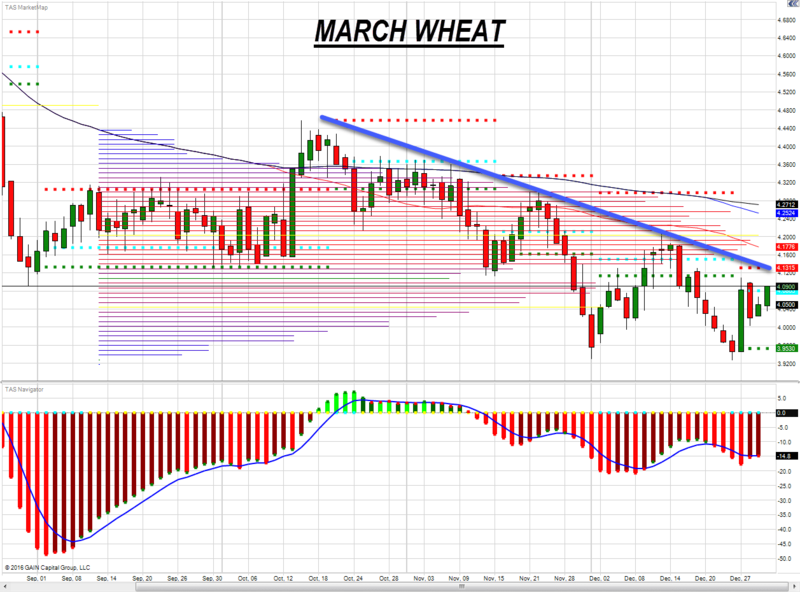 Still, bulls are staring down a 3-month bear trend resistance line at 412’0. This also intersects with the recently formed TAS supply zone at 413’0 so expect to potentially see a struggle to push much higher near term. A close above this line would shift the trend more bullish, although the market would also be entering a heavy previous congestion zone between 415’0-430’0. For folks with wheat in the ground now, I like having a limited risk 1×2 call spread position on, similar to corn, in an effort to pull the 500’0 July price closer. We have very specific ideas on ways to position for these potential market moves. Whether you are a producer, end user, or trader, we’d like to work with you! In case you haven’t reached out already, feel welcome to do so by calling me directly at 877-566-5463. I would love to hear about your marketing and/or risk management plan or share some ideas of my own if this is something you are searching for. For those who we already have a relationship with, thank you for following along. Wishing all of our readers all the best for a safe and prosperous 2017! Technical Ag Knowledge – Paid Edition – Monthly - Whether you’re a producer, end user, or trader in the agricultural commodity markets, “Technical Ag Knowledge” will provide you with a crucial awareness of key technical price levels each week so you can manage your positions with conviction and confidence. Technical Ag Knowledge – Paid Edition – Monthly includes an email newsletter subscription. Technical Ag Knowledge – Paid Edition – Monthly trial lasts 30 days.